"In 1974 when Bob Marley went solo, on the brink of international stardom, he surprised the music community by choosing as American born lead guitarist, Al Anderson. It was Anderson's stunning lead work on such classics as 'No Woman, No Cry' and 'Three O'clock Road Block', that first alerted rock fans to the Wailer's music. Andersons' musical achievements with Bob Marley & The Wailers include the platinum award winning albums Live at the Lyceum, Babylon By Bus and ten times platinum album Legend. The Orignal Wailers received their own Grammy nomination in 2013 for their album Miracle making it Andersons' second Grammy Nomination. Al Anderson is the sole member of the Bab Marley & The Wailers mid - 1970's lineup in the Original Wailers. 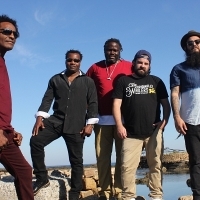 The band also includes Chet Samuel (Lead Vocals / Guitar), Omar Lopez (Bass Guitar), Paapa Nyarkoh (Drums), and Adrian AK Cisneros (Keyboards and Organ) who continue the legacy of Bob Marley & The Wailers' music."